Dr. Soumya Siddabathula completed her M.B.B.S. from Osmania Medical College India in 2002 and M.S. in Obstetrics and Gynaecology in 2006 from Kakatiya Medical College Warangal. She has done a certificate training program in Obstetrics and Gynaecology ultrasonography and has around 8 years post M.S. experience in Obstetrics and Gynaecology in India and Dubai. 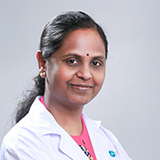 She is experienced in management of normal pregnancies and deliveries instrumental deliveries, Gynaecology procedures with special interest in management of infertility. She is well versed in English, Telugu, and Hindi.